Meet the Once-ler. Back in the past, he found a forest of Truffula Trees. Through ingenuity, he found a way to make these trees into something that everyone could use. However, the Lorax shows up to try to warn him of the dangers that might cause. Will the Once-ler listen? I had this book as a kid, and we read it many times while I was growing up. Rereading it as an adult, I was struck again by just how dark this book is. There is a clear environmental message to the book. I do wish it were more even handed, but I realize this is a picture book for kids, and a morality tale at that. The pictures and creatures are pure Dr. Seuss and are fun. The story, while told in rhyme, features some of Dr. Seuss’s made up creatures, so it isn’t early reader friendly, but as kids are ready to tackle something more challenging with the help of adults, this book would be great. 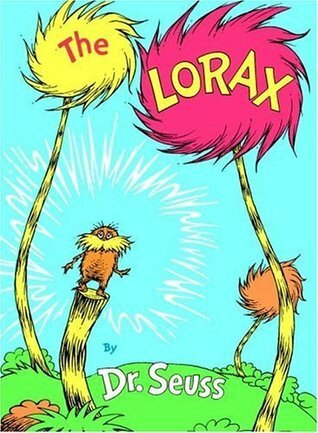 Sign into Goodreads to see if any of your friends have read The Lorax.